Réservez votre unité de libre-entreposage dès aujourd'hui! 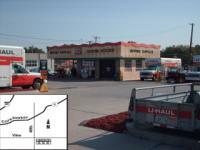 U-Haul Moving & Storage of 48 & Vine est l'une de nos installations d'entreposage de premier choix à Lincoln, NE, qui offrent des unités de libre-entreposage propres, sèches et sûres. Nous offrons des unités d'entreposage de diverses tailles pour répondre à vos besoins en matière d'entreposage personnel et de déménagement. Renseignez-vous à savoir si des unités de libre-entreposage climatisées, offertes à certains des prix les plus bas du marché des unités d'entreposage, sont disponibles. Les heures d'ouverture des installations d'entreposage sont sujettes à changement, bien qu'un grand nombre de nos installations de libre-entreposage soient ouvertes 24 heures par jour et offrent un horaire d'accès prolongé. En fonction de vos besoins d'entreposage et du lieu, informez-vous sur l'entreposage de véhicules récréatifs, de bateaux, de motocyclettes et du libre-entreposage de véhicules à Lincoln, NE, 68504. Notre solution d'entreposage portatif U-Box pourrait parfaitement convenir à vos besoins en matière de déménagement et d'entreposage. Demandez-nous comment nous pourrions vous aider! Very helpful, and friendly people to work with. The guys at this store were beyond-words amazing! I cannot say enough about them. Friendly, helpful, courteous and so many other synonyms. They made the whole experience very easy and I would go back. Employees at both locations were great. Friendly and all. They accommodated us with a free day because of a blizzard which was very helpful. All in all. I'd definitely return on my next move. The customer service was incredible. Thank you. I've rented vans at this location for years not to mention my recent storage. I've ALWAYS found the staff, Jason and the entire staff helpful, pleasant and courteous. I can't thank them enough!! I would highly recommend this facility. Great people! They were a little slow but they got it done. If you’re going to offer a customer a credit, then give them the credit. You overbill and are overpriced. Counter staff was always friendly and when my daughter rented a truck for moving they went above and beyond to help her out. We rented a 15' truck from Alabama and drove to Lincoln. Everything about the trip went smooth, from the truck (awesome) to the storage facility. I would recommend U-haul to everyone! 100% positive experience all the way around -- I would definitely recommend this facility. Jason and his entire staff are incredibly helpful and kind. They are always willing to answer questions and made the entire process of moving in and moving out very simple. The staff never answered the phone. I only spoke to customer service and I had an issue that customer service could not help me with. Upon relocating to Nebraska and having to get a storage for my belongings they were extremely helpful. And they made things so much easier than I would have imagined. I would like to say Thank You!!! I would have given 5 stars, but there is one young lady that I spoke with over the phone that has a major attitude problem. Everything else and all staff were great and helpful. Very helpful Team! This facility Management provided replacement vehicle when the U-Haul Corporate Management did not respond! Again...thank you. From Denali & Sikora. Thank you for supplying me with a clean dry area to store my items. I know where to go if I need storedge in the future. The amount of things that went wrong with the initial customer service was frustrating, not professional and I'll was over promise and Uhaul under delivered. This was the worse experience ever.